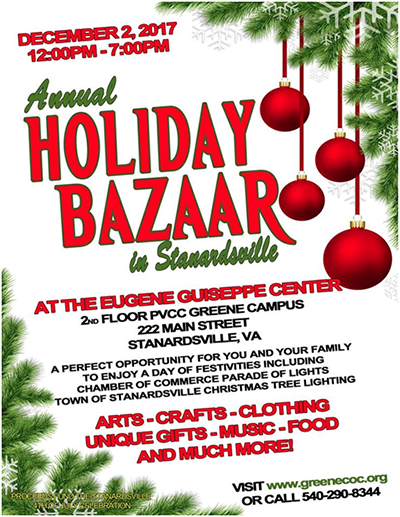 Held the first Saturday of December at the Eugene Giuseppe Center in the heart of Downtown Stanardsville, the Annual Holiday Bazaar is a perfect opportunity for you and your family to enjoy a day of festivities including the Chamber of Commerce Parade of Lights, Town of Stanardsville Christmas Tree Lighting, Breakfast with Santa, Cookies with Santa events and much, much more. We will post information here once registration opens for the 2018 holiday bazaar. Please also follow us on Facebook at: www.fb.com/RWBnG to catch the latest news and updates as well as participate in giveaways, contests and more.